and you simply plug in the values for the change in temperature ( ), change in forcing ( ), and change in system heat uptake rate ( ) and out pops an answer. My question, however, was trying to delve slightly deeper into this issue, which I’ll try to explain below. As discussed in Section 4 of this paper (Earth’s energy imbalance and implications by Hansen et al.) for a given climate sensitivity, the climate response function (defined as the fraction of the fast-feedback equilibrium response to a climate forcing) depends on the rate at which energy is mixed into the deep ocean. If energy is mixed into the deep ocean slowly, then most of the energy will heat the upper ocean, land and atmosphere, and the climate response will be fast. If, however, it is rapidly mixed into the deep ocean, then the climate response will be slow (the upper ocean, land and atmosphere will warm more slowly). This will manifest itself as a difference in the magnitude of the planetary energy imbalance that can be sustained; if the climate response is fast, we’d expect the typical planetary energy imbalance to be small; if it is slow, we’d expect it to be larger. This is illustrated in the figure below, which shows examples of 3 different climate response functions, all of which can match the historical surface temperature record, but which produce different planetary energy imbalances. If the climate response is slow, we might expect a planetary energy imbalance today of around 1Wm-2. If it is fast, we might expect it to be less than 0.5Wm-2. Given that, today, it is probably somewhere between 0.6 and 0.8Wm-2, Hansen et al. (2011) suggest that an intermediate response is more realistic and that most climate models possibly mix energy into the deep ocean too rapidly (they tend to have slow climate response functions). However, is this sufficient to explain the discrepancy between a TCR-to-ECS ratio of 0.6 to 0.7 – suggested by most climate models – and a value in excess of 0.8, as suggested by Nic Lewis’s work? In trying to understand this better, I came across a paper called Model structure in observational constraints on transient climate response, by Miller et al. 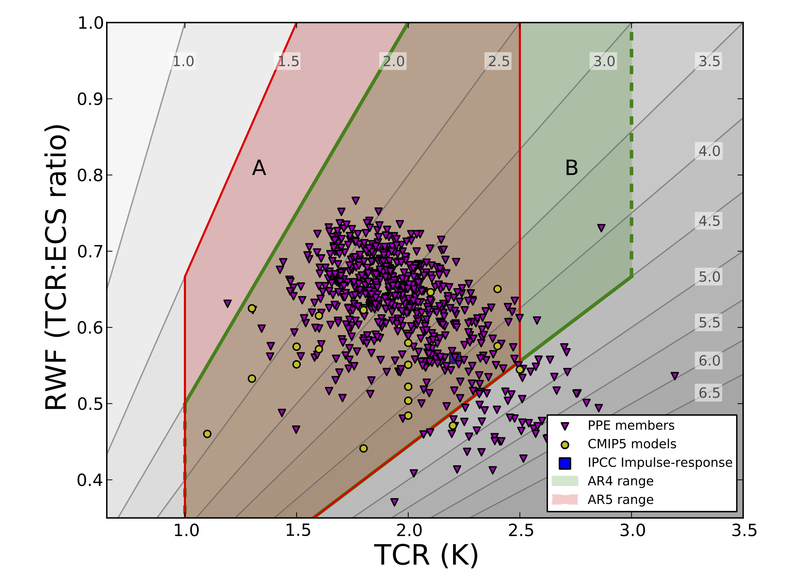 It includes the figure on the right that shows the TCR-to-ECS ratios for Perturbed Physics Ensembles (PPE), CMIP5 models, and also includes the AR4 and AR5 ranges for TCR and ECS. Judging by this figure, it would seem that a TCR-to-ECS ratio between 0.8 and 0.9 is possible, but would seem to require that the TCR be quite low; less than 1.5oC, which is indeed consistent with Nic Lewis’s best estimate. However, this still doesn’t really indicate that a TCR-to-ECS ratio greater than 0.8 is consistent with the planetary energy imbalance being greater than 0.6Wm-2. I’m not quite sure where to go with this. This post is really just some thoughts on this. It seems that a TCR-to-ECS ratio above 0.8 is possible if the TCR is sufficiently low. Given how much we’ve now warmed, however, a low TCR is becoming less likely. Also, if the system can sustain a planetary energy imbalance of between 0.6Wm-2 and 0.8Wm-2 might also suggest that a TCR-to-ECS ratio above 0.8 is unlikely, because the potential amount of committed warming could then be larger than 20% of a low TCR. I should say that I think Nic Lewis’ work is very interesting and makes a valuable contribution to our understanding of climate sensitivity. However, it does suggest some things that are at odds with other estimates; such as a much larger probability of the ECS being below 2oC, and a higher TCR-to-ECS ratio. Also, there is the possibility that feedbacks are time-dependent in such a way that observationally-based estimates of climate sensitivity may suggest that climate sensitivity is lower than it actually is. I should also add that focusing only on climate sensitivity can be a bit misleading, as how much we will actually warm will depend on climate sensitivity and on carbon cycle feedbacks. These can be combined into a single quantity called the transient response to cumulative emissions, which is thought to be between 0.8oC and 2.5oC per 1000GtC. Since we’ve warmed by almost a degree after emitting just under 600GtC might suggest that the lower end of this range is rather unlikely. I’ll stop there. Comments welcome. This entry was posted in Climate change, Climate sensitivity, ClimateBall, Global warming, Science and tagged Climate sensitivity, ECS, Energy balance models, James Hansen, Nic Lewis, TCR, TCRE. Bookmark the permalink. Considering the standard consensus for ECS is 3C, even in spite of that recent cloud study, what is your thought on China and the US pushing for early ratification of Paris? Also, I’ve heard from Bob Berwyn that scientists he’s talked to say the range for the pledges could be 2.5-2.7C. Any idea where the likely range for Paris from 2.7-3.5C might fall, feedbacks included? I should also add that focusing only on climate sensitivity can be a bit misleading, as how much we will actually warm will depend on climate sensitivity and on carbon cycle feedbacks. I don’t know that I have a good answer to that. My preference is to think in terms of TCRE (the transient response to cumulative emissions). The range is 0.8 to 2.5oC per 1000 GtC. We emitted, in total, just under 600GtC and warmed by just under 1oC. This warming may not be all forced, but my guess would be that something just under 2oC per 1000GtC would be a reasonable estimate. We’re emitting around 10GtC per year, so unless these comittments can result in us not emitting anything more than about another 400GtC (40 years at the current rate) we’re going to find it difficult to stay below 2oC. From the Paris deal alone, my understanding is that the expectation is that we’ll warm to about 3.5oC, essentially because the Paris deal doesn’t really lead to the emission reductions that would be required to achieve the 2oC target. Joe Romm’s post lays it out quite clearly. That’s essentially right. Climate sensitivity is really a model metric that indicates how sensitive that model is to changes in external forcing. Clearly it can be related to the real world, since that is what the models are trying to represent, but there is no real world scenario exactly equivalent to a model run in which climate sensitivity is determined (increasing atmospheric CO2 at 1% per year for 70 years). Do you think getting under 3C is a reasonable possibility? If our current understanding is correct, then it’s not – IMO – going to be easy. On the other hand, we seem to have the ability to make quite substantial changes on relatively short timescales. I think the biggest hurdles are societal and political, not technological. I tend to think we’ll probably end up between 2.5 and 3C. As you said, it’s not easy for sure. It’s also not a great place to end up, but it’s better than higher up. There’s also the question of SRM, which I believe research funding was allocated for in a recent US Senate bill. That’ll be an interesting situation to follow. I find your post about the ability to make substantial changes in short timescales revealing. It’s part of the contrast I see with Kevin Anderson. I agree with his data, but his interpretation of it is up for debate, especially compared to Michael Mann, who didn’t have very positive things to say about him in an email exchange I had with him. It is important for Anderson to highlight the severity of the challenge we face, but it is quite another to consistently downplay every good piece if news about emissions and renewables. His message is in essence that no matter what we do with emissions and renewables, it won’t matter. I don’t think that’s true and it’s certainly not helpful. He also doesn’t ground his own solutions in feasible reality. I actually have quite a lot of time for Kevin Anderson. I realise that his message is a bit pessimistic, but he backs it up with numbers and is at least both illustrating the severity of what we face and trying to get us to recognise that we have to take it seriously (at least, that’s how I interpret what he says). I also, on the other hand, have sympathy for those who argue that we can do something about this and that we should remain optimistic. At the end of the day, I don’t think anyone really knows how best to be effective and I have trouble being too critical of those who are at least trying to get people to take this seriously. His numbers can be a bit misleading at times, though. For instance, he tweeted that the first review cycle for Paris is in 2023, which is not true. It’s from 2018-20. I also fail to see how saying “I think we will fail”, and emissions reductions and renewables progress as of little consequence as a good way to get people to take the issue seriously. That kind of language turns people off, which is part of the reason why Michael Mann has a much bigger following than Anderson. My point is that he can spread his message without being so doomerish. My point is that he can spread his message without being so doomerish. Yes, I do tend to agree. Even so, I respect him for his activism.We need more of it. On another point, I can’t overstate the importance of the 2016 election here in the states. The Dems have to win this to keep Paris going and strengthen our commitments. Fortunately, I think that will happen. I realize some people are skeptical about Clinton, but I honestly see her expanding Obama’s policies, in no small part due to Sanders’ influence. Indeed, and he also seems to be one of the more outspoken UK-based climate scientists. My preference is to think in terms of TCRE (the transient response to cumulative emissions). The range is 0.8 to 2.5oC per 1000 GtC. We emitted, in total, just under 600GtC and warmed by just under 1oC. This warming may not be all forced, but my guess would be that something just under 2oC per 1000GtC would be a reasonable estimate. So very much in the ballpark. Personally I like Kevin Anderson and his message. He does ask people to do something about their demand side as supply side technologies can’t cut demand in the short term. Sure it’s 2c is unlikely but we can all try. I doubt personally that just pushing all technology onto a revamped electricity grid that’s GHG free at source and has the capacity to run everything is likely. Lifestyle changes will be required also. It depend what type of lifestyle changes you’re talking about. If you’re talking about major ones in developed countries in favor of letting developing ones emit willy-nilly, that’s not going to happen. And I don’t necessarily agree that major lifestyles changes are needed. > And I don’t necessarily agree that major lifestyles changes are needed. Contingently agreeing ought to be enough. The only lifestyle choice that matters is reducing your GHG emissions individually. How you do it is up to you. If we think that all can be achieved without any individualistic reductions than fine but I personally am not looking forward to seeing the UK covered in wind turbines and solar farms which is what is required. Of course, Pete. Completely agree with you. Much depends on time. If it takes a long time to reach E, then the ratio is low because the extra energy diffuses into the deep ocean reservoir. I’m not certain the developing world is entirely getting on the hook for emissions. In many cases, they are going directly to renewables for many obvious reasons. It’s definitely not an easy quandary to solve, wheelism. I wish I had the answers. Anoilman, you are right when it comes to India. And I would say you’re probably right in general. I have to say, first time being on this blog, I like talking with you guys. Bobcobbblog: Nothing going on is ‘easy’. The first 20-30% conversion to renewables is easy and doable. After that, we need storage and bigger grids, neither are there, and the grids are pricey. If you want a dose of OMG.. I recommend you read the articles on renewables over at the Science of Doom. It really is a good and pessimistic look at it all. With all the doom and gloom out there you need to look at the fine print. Sure China is building new coal power plants, but all those plants were built with Western environmental gear to clean up their air. Those sales dropped off ages ago (trust me… I know). And as they are opening new plants, they are closing old ones and moving factories onto the grid. So.. before getting all worried, keep calm, be pragmatic, and do the right thing. We are dependent on fossil fuels for now, we can quit, but we just need to hit the right price points, and frankly new tech to help out. In the mean time, keep working at it. Since debate has turned more to the scale of challenge and AGW mitigation, I decided to drop in. This article also implicitly shows why LCOE, while a useful metric, is better to be replaced with system LCOE when talking about AGW mitigation. Unfortunately, he also said that they were telling that for 5 years and how US is doing it the wrong way. What will be very challenging in terms of AGW mitigation is that India is stepping in place of China and while it will probably face even bigger challenges than China did, its response potential is difficult to be estimated to surpass or match that of China. Nic Lewis has a new post at Dr. Curry’s blog. I was wondering if he has said anything there to address your concerns you raise or if you had any other comments. Current best estimates of GMST (4.0 ± 0.8°C below preindustrial) and of relevant forcings (6–11 Wm−2 below preindustrial) at the LGM imply an ECS estimate of 1.75°C, essentially identical to the updated instrumental-observation energy budget estimate presented here. That suggests effective and equilibrium climate sensitivities in the real world may be very close to each other, but only about half the average equilibrium sensitivity of CMIP5 models. A claim that paleoclimate studies of the last glacial maximum produce a median ECS estimate of 1.75 per doubling would be startling if it appeared in a peer review journal. 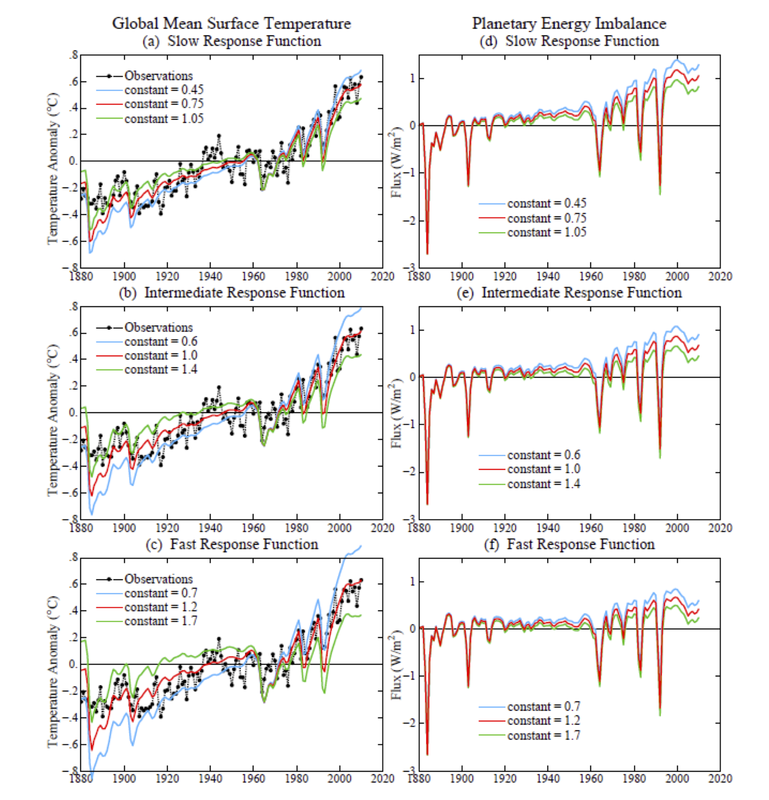 Careful use of estimates of effective radiative forcings and planetary heat uptake. Simple but robust global energy budget approach was used, with thorough treatment of uncertainties. Not really. Seems to be just an updated version of what he’s presented before with various arguments as to why he can ignore the various criticisms. As VTG says, would be interesting to see him publish a 1.75C ECS for the LGM. Sorry but I have to part ways with Nic WRT to his choice of surface temps. That should come as no surprise as R Way and I questioned him about this on Climate Audit. in observations. It seems pretty simple to report the results given alternative sources. That would be thorough. And easy. It’s not like we would all be confused. If the choice makes no difference then thats important too. hmm. gotta go back and read that. It’s an AMO screw up. Annan or Hargreaves views on the conclusions he draws would be interesting. Sceptic that I am, I expect he’s making a cheery pick; it would be great if he made claims like this in the literature rather than a blog so I could be proved wrong. His number certainly seems an outlier. Lewis’ claims about the LGM sensitivity are selective, which seems to be a naughty, reoccurring habit of his. In addition to the the PALAEOSENS work, there’s also been recent reevaluation of past LGM ECS estimates’ state dependence. I don’t think Lewis’ claims are as robust as he would like to imagine. “Annan or Hargreaves views on the conclusions he draws would be interesting. he has another comment on it.. dismissing James as not valid. invalidated without getting input from James. to be fair lots of folks engage in this.. I have I know. James’ take on things would be in order. I just ask myself a simple question. had an impact on the result. Given how much we’ve now warmed, however, a low TCR is becoming less likely. I am trying to understand this so tell me if I have this about right. The temperature has risen around 1C since pre-industrial times (1880?) and CO2 levels have gone from 280 to around approximately 400 ppm in that same time frame. This means that currently we are only around 40% of the way to doubling emissions. So if the warming since pre-industrial times is entirely or almost entirely due to CO2 emissions then you would expect TCR to be somewhere around 2C. One thing I am not sure is how changes to concentration of other greenhouse gases like methane fit into this conclusion. “Cheery pick” = selectively, overly optimistic choices of data? Whilst the AR5 ERF estimates are supported by multiple studies and thorough assessment, expert judgement also played a role. This limited dependence on complex climate models makes energy budget estimates of ECS particularly robust with regard to dependence on model assumptions, subject to satisfactory forcing, heat uptake and surface temperature data being available. Uncertainty in aerosol ERF is the largest contributor to imprecision in estimating ECS and TCR. Uncertainties in heat uptake and in WMGG forcing are substantially less important. Progress in reducing aerosol forcing uncertainty is therefore key to narrowing observationally-constrained estimates of climate sensitivity. Without a reduction in aerosol ERF uncertainty, additional observational data and extended time series may not lead to a major reduction in ECS and TCR estimation uncertainty. Clearly further research with limited complexity, assumptions and expert judgement is necessary. Once that’s done, we can begin to whittle away at the error bars on projected future emissions. This is definitely require a lot of time for us to figure out. On a more serious note, I thought clouds were the major Bogey Monster. I don’t think criticisms of Lewis’ work on the basis that he should include other forcings to give an “effective TCR” are at all valid. Remember that future temperature projections also include projections of all future forcings, (CO2e) not just CO2. So to include them in the estimation of TCR would be double counting. Indeed. I also think he does include them. What he’s using is the net change in anthropogenic forcing (in fact, it might be the next change in external forcing). For background, many moons ago it was pointed out that there is no clear correlation between magnitude of global average LGM cooling and 2xCO2 warming from pre-industrial across multi-model ensembles (e.g. PMIP2,PMIP3). Therefore, a model matching (or not matching) LGM global average cooling estimates could not be used to constrain future CO2 warming. Taking on board the lack of global average correlation, Hargreaves and Annan noticed that there was a correlation for tropical ocean surface temperatures when checking between the same simulations. Therefore, it may be that estimates of tropical temperatures could be used to identify more realistic models and therefore constrain future warming. It now seems the correlation does not appear when looking at an ensemble of more recent models, although combining the older and more recent into a single ensemble still seems to return a correlation at least bordering significance. How to interpret that is not entirely clear. Hopcroft et al. 2015 suggest the lack of correlation was caused by introduction of vegetation and aerosol modules in the newer models, which add greater complexity. One thing is clear: If there is no LGM/2xCO2 temperature change correlation across GCMs, then a simple energy balance calculation for LGM cooling doesn’t obviously have any relevance for 2xCO2 warming. So, dismissing Hargreaves and Annan’s tropical SST estimate on this basis likewise dismisses the simple energy balance calculation. The odd development in this kind of work is the suggestion, explicitly made in one of the quotes collected by Brandon Gates’ above, that simple energy balance model results are more robust and make less assumptions than more complex models. I think that view confuses mathematical simplicity with robustness in terms of its relationship with the real world, and hides the myriad implicit assumptions which go along with using the simplified model. The reality is that these simple models can only really claim any validity in so far as they approximate GCM responses. The really bizarre thing I’ve noticed is people apparently deciding to side with simple energy balance models against GCMs where they disagree. Are you talking about clouds being a major source of uncertainty? The reality is that these simple models can only really claim any validity in so far as they approximate GCM responses. The really bizarre thing I’ve noticed is people apparently deciding to side with simple energy balance models against GCMs where they disagree. In terms of climate sensitivity, one of the big uncertainties is the cloud feedback. Energy balance TCR+ECS estimates are pulled down by pre-1970 data. Since 1970 temperatures have been rising faster per % increase in GHG forcing than indicated by the energy balance method. To illustrate, using linear regression, since 1979 GHG forcing (all GHG except ozone per NOAA AGGI) has increased by .0092 of 2XCO2 equivalent per year or 0.42 of 2XCO2 over the entire 45-year period. During the same period HADCRUT has increased by 0.0178C per year or 0.79C in total. So the implied TCR over the past 45 years is roughly 1.9 (0.79/0.42) C per 2X CO2. This simple calculation ignores aerosols, ozone and natural variability, but includes enough relevant factors to call into question the value of the simple energy-balance method in projecting future impacts of GHG. A simple energy balance model gives you a single number. A more complex model provides a great deal more. Indeed this was one of the first things Eli noticed from Hansen et al 1988, the patterns of response. It is a good reason NOT to get hung up on TCS or ECS or whatever S.
It is a good reason NOT to get hung up on TCS or ECS or whatever S.
Agreed. I suspect that some of the focus on these simplistic metrics is to try and deflect from other relevant factors. I was going to make just such an observation myself, but am now spared the effort. If you call something a control knob, dont get too hung up if people try to focus on the gain. metaphors are good up to a point. then not so much. Thanks. So, it does look like Nic’s suggestion that paleo evidence supports an ECS around 1.7C is not what one would find in the published literature. As I also have been saying all along. You are *wrong* to defend the indefensible behaviour of ‘sceptics’, again. It’s one of life’s mysteries why you keep on doing it. My hunch is natural variation did the opposite of what it appears he has used in his estimate. If the AMO is responsible for half of the warming, his number would be around 1℃. I don’t think the AMO is responsible for any of it, and I think the PDO has been suppressing warming since around 1990. I think people who don’t study it would be shocked to hear how little effort has actually been spent trying to understand the physical oceanographic/coupled ocean-atmospheric properties of the purported Atlantic Multidecadal Variability, relative to say ENSO. This is why as recently as a few years ago you can have a mainstream scientific journal publish a paper asserting that the AMV essentially doesn’t exist (at least as most know it), i.e. Booth et al. 2012. Now, to be sure, that is a minority position, and several legitimate criticisms of that paper have been published. But there is still a very, very active debate on what exactly the AMV is, to what extent it is driven by changes in the AMOC, external forcing, and stochastic processes, etc. For anyone to simply add in the linearly-detrended AMO index as a regression term- to me- suggests a surprisingly ignorant orientation to the relevant scientific literature. Regarding climate sensitivity, it is barely above 1K without amplification by positive feedback of increased atmospheric water as vapor/clouds. This 1K figure as determined by measurements in the laboratory. Thus the whole AGW issue rests on the question of whether increased atmospheric water acts as a positive feedback, amplifying the CO2 forcing. The simplest of observations will provide the answer to the above question. Going from the dry Sahara to the humid tropics increases specific humidity from, say, 0.5 % to 3%, or a 600% increase. What do we observe concerning temperatures? We see that increasing specific humidity by 600% only diminishes the diurnal range through moderating its extremes. In other words, a lower tmax and a higher tmin. Hence, proceeding according to sound scientific principles and basing our conclusions on observations rather than mere theoretical musings, what can we conclude about the role of increased water vapor in determining temperature? Could be that there is no cause for alarm. Given that we’ve warmed by about 1C and am probably only about 2/3 of the way to doubling CO2 (in terms of the change in forcing) we can probably conclude that some positive feedbacks are operating and the one of these is probably water vapour. Whether you’re alarmed, or not, is your choice. On the other hand, if you mean could the changes be relatively small and easy to deal with. Possibly. On the other hand, maybe the changes will be quite substantial and the impacts will be severe and damaging. If so, the evidence suggests that the changes will likely be irreversible on human timescales. Given that we probably need to think about whether or not we should do something to ultimately reduce our emission of CO2 into the atmosphere, or not. There is virtually no evidence for equilibrium climate sensitivity being close to 1°C for the entirety of the Phanerozoic. Quite literally our understanding of climate over geological time is incompatible with the claim that ECS is very low. We can confirm the existence and bound the magnitudes of positive feedbacks like water vapor and ice-albedo using observations. You’re substituting oversimplified argumentation for rigorous scientific inquiry. Well, the fact that warmer air holds more moisture before precipitating out is also pretty well-established from laboratory experiments. As are the radiative properties of water vapor. So which part of the water vapor feedback do you feel to be iffy? Re: deserts vs humid tropics, I think you’ve left out quite a few other variables that confound your analysis. E.g., oceans across the tropics both increase the humidity and mitigate temperature swings; correlation =/= causation. And temperatures are not simply based on local variables like humidity, but also on variables hundreds of miles away. There are connections via wind currents between the tropics and the Sahara which will dry or moisten the air; their temperatures and absolute humidity don’t operate independently of each other. So you can’t even really separate them out like you’re trying to do. They aren’t so local. Could be that the melting cyrosphere didn’t get the memo. Well, Booth et al 2012 don’t argue AMV doesn’t exist (as a arbitrarily defined index it exists no matter what), all they say is that it may well be caused by external forcing (in fact 85% attribution). Clement et al 2015 showed that you don’t need more than a mixed ocean to get all things AMV. Only on longer timescales there’s a positive heat flux component from the ocean back to the atmosphere. However, in my mind the internal contribution is easily masqueraded by external forcing, let alone strongly varying anthropogenic (keyword “dimming/brightening”) and volcanic forcing. Sure, there’s no consensus whatsoever on the issue in the scientific community, but that’s mainly because the traditional view has been that the ocean circulation is the grand master. As always, it’s extremely hard to shift such widely held views, but I’m confident it’ll happen sooner or later. For example, it is easy to demonstrate that the current “cold blop” in the North Atlantic is caused by persistent atmospheric circulation anomalies linked to teleconnections with the North Pacific (PDV positive leads to AMV negative). It is added on to the underlying cold anomaly in the same region which is likely the signal of the salinity-induced AMOC slowdown. Hence I totally agree with your concluding paragraph. Anyone who uses the AMO/AMV index as a regression term can’t and should not be taken serious. Luckily, the recent surge in GMST provides ample evidence that such AMV-based regression is bound to fail miserably. In my defense, I did say “(at least as most know it)”. I think we are in much agreement here. I would actually love to chat with you over email about this if it’s a topic of interest to you. The “AMO” in its Enfield, linearly-detrended form has become something of a white whale for me. I would love to brainstorm with some people involved in the aerosols side of things on it. I would actually love to chat with you over email about this if it’s a topic of interest to you. Your comment reminds me that I went to a talk by Booth about how the variability might be driven by aerosols (IIRC). I think it was about a paper that was to be published, but I haven’t checked to see if it’s appeared yet. I’m just a cowboy with hunches, so I cannot participate. This link showed up today. Yepp, agreed that we agree 🙂 Very happy to chat about it in more detail via email. I’m looking forward hearing from you. Perhaps we can share the results in a condensed version here later on as well so that our dear host ATTP benefits as well. Perhaps we can share the results in a condensed version here later on as well so that our dear host ATTP benefits as well.